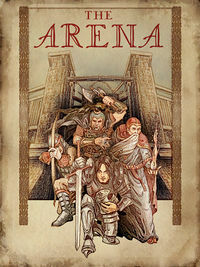 To join the gladiatorial ranks of the Arena, speak to Owyn, the Blademaster in the Bloodworks. You will automatically become a member of the Blue Team. ^b Agronak gro-Malog is fixed at Level 10 and will not level up with you (though his weapon and shield will). Because of this, you will find him to be a fairly easy opponent if you are above (or even at) Level 10. If you have reached the higher levels of the game you will find him to be no challenge at all. ^c Although Agronak gro-Malog is labeled as the Grand Champion, he is not in the faction within the construction set. Completing the Origin of the Gray Prince side quest may make it impossible to become Grand Champion, if done a certain way. If you have an active conjuration effect that provides boots, greaves, cuirass, or gauntlets (such as from a spell or a Hestra Rune Stone) attempting to equip the arena raiment will fail, but the game registers it as being worn. This means you can equip any other armor and go into the arena to fight. You will not be disqualified for not wearing the raiment. ? Esta página foi modificada pela última vez à(s) 23h35min de 5 de janeiro de 2016.